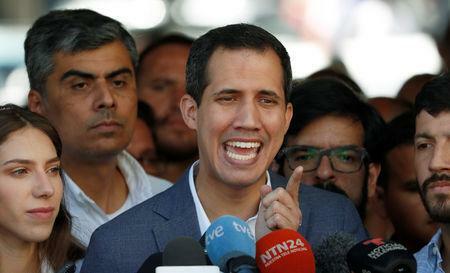 CARACAS (Reuters) - Venezuela's opposition leader, Juan Guaido, said on Monday his team had delivered a first cargo of the humanitarian aid that has become a flashpoint in his tussle with President Nicolas Maduro, without specifying how it had received it. Guaido, who has been recognized by most Western nations as Venezuela's legitimate president over the past month, tweeted a photo of himself surrounded by stacks of white pots of vitamin and nutritional supplements. He did not say from where or whom they came. 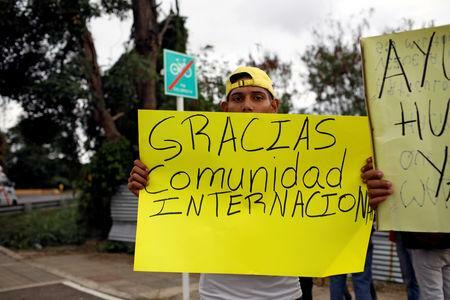 "Today we delivered the first donation, or the first cargo of humanitarian aid, albeit on a small scale, because you know they have blocked the border for the time being," Guaido, 35, said in televised remarks in Caracas on Monday evening. Venezuela's opposition has been coordinating an effort by Western nations, companies and organizations to deliver aid to Venezuela where malnutrition and preventable disease have proliferated in recent years as the economy has nosedived. Maduro has said this is part of a U.S.-orchestrated strategy to undermine and ultimately overthrow him. He says he will not allow this "show." 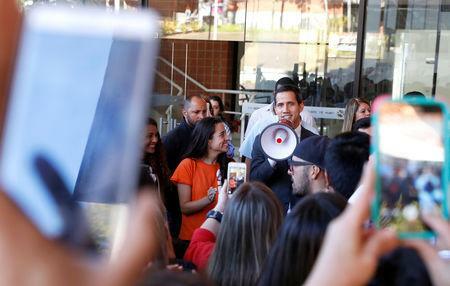 The United States last month recognized Guaido as Venezuela's legitimate leader after he declared himself president. Guaido argued Maduro's re-election last year was a sham. The United States has since been joined by a majority of Western nations. Senior U.S. officials last week heralded their country's efforts to move aid to Venezuela's doorstep, after U.S. supplies were among those delivered to the first collection point established, in the Colombian border town of Cucuta. "(Guaido) will announce the day when, from Colombia, from the islands by sea, and from Brazil the humanitarian aid will arrive simultaneously," Toledo said.